Splash pages, you gotta love 'em. A blank canvas where the artist can hit you with a large dose of illustrated 'wow'. This week, with Valentine's Day being just a few sleeps away, I wanted to pick an artist / character combo that will always be in my heart - Chris Bachalo and Ghost Rider 2099. Heck, as love knows no bounds, let's make it a double pager. This was a relationship with magic. 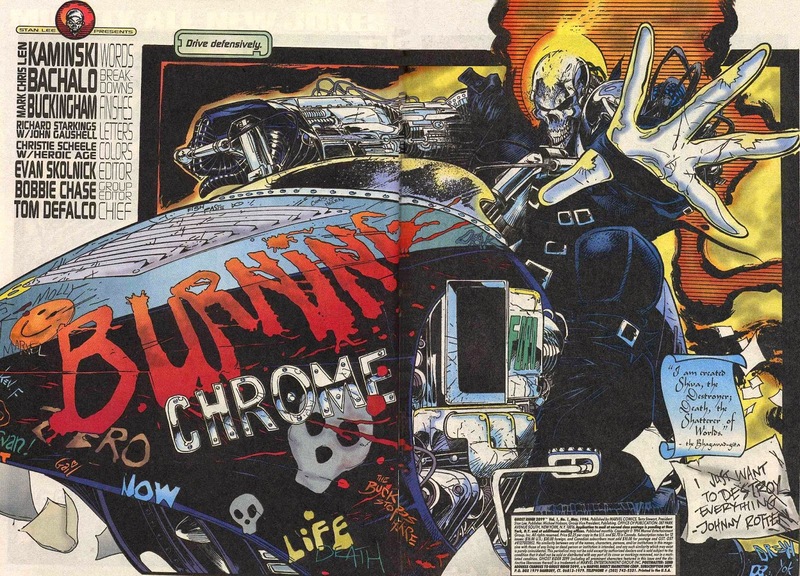 Sure it gets overlooked for Chris's glitzier affairs like Generation X, Death or the X-Men, but in creating a cyberpunk future (and a spirit of vengeance to go with it) Ghost Rider 2099 was unlike anything that had come before or has been since. Well, at least until the relaunch. I had the first few issues of this when they came out... I quit after issue #3. He looked cool, loved the hologram-flame, but the story was just too lame. That cyberpunk/hacker/extreme thing just did not work for me. What issue is that from, please? That's issue #1, I believe. Hey Anon - King is right - thanks for stopping by! King, I thought it was pretty cool right the way until Bachalo left. Same with Generation X and to some extent Death, after that dude has made his mark with a character(s), it is pretty hard for anyone else to do them justice.